My husband and I were lucky enough to go on a city escape where we stayed at The Langham, during the July and September school holidays. On the first visit, during our shopping expedition, we visited the fabulous Louis Vuitton store, located downstairs in the Crown Entertainment Complex. This particular Louis Vuitton store features the first private salon in Melbourne. I was served by the most amazing and sweetest sales consultant, Evelyn. She was very knowledgeable about all of the products and more than happy to show me the LV Speedy and the Alma handbags, in both the Monogram and Damier canvas. As soon as I held the Alma Monogram handbag, that was it for me. I was in Iove and had to have that bag!! So, the saving began. It almost killed me not being able to spend any of my usual budget on frivilous things, but I managed. I recommend that if you want something badly enough, you try to save up, because the end result is so worth the sacrifice. When we arrived home, I couldn't wait to do the 'unboxing'. Every Louis Vuitton handbag comes in a dust bag and box, wrapped with a leather tie. The Alma handbag has a lock and key as well, for safe keeping of its contents. I had the leather key holder hot leather stamped with the initials S.M in gold to personalise the handbag. Inside the bag, there are two pockets, where I store my mobile phone and mints, as well as a spacious interior for all of my other necessities. There are four brass feet to protect the bottom of the bag. The leather handles, key holder and base are made from cow hide. With age, this leather patinas, meaning it will darken and turn a deep amber (honey) colour. The Alma handbag has a very famous history. 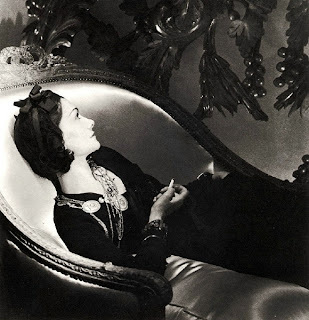 It was created out of a necessity for Madame Coco Chanel. She requested that Gaston Vuitton make a travel bag for her, and so the Alma bag was created. It is absolutely beautiful in it's design and features. I only use my Louis Vuitton handbag for special occasions and day trips. Actually, it's quite funny really. I joke about this with my friends and family. I love Alma that much, I refer to the handbag as 'she' or 'her'. Alma is like a friend. I feel wonderful when I am with her. I cannot wait to take Alma out with me again. She's already been to Creswick (seen in this post) and Sorrento. I enjoy wearing 'her' immensely and I know 'she' likes going out with me too!! What's something you have saved up for that you love? I'd love to hear about it. What I'm wearing: Blazer and silk blouse by Max & Co, jeans by RM Williams, boots by Paul Green. How fabulous! Congrats on your new bag!! Thanks Michelle! I am very happy with this special purchase. Thanks for your comment Ivory! It's such a shame you had to sell your Alma. Sorry to hear about that! However, the beauty of owning a LV handbag is that, should you need to sell it, you will always be able to. I am looking forward to seeing the colour of the vachetta leather change as it patinas!